Located on the eastern side of the Po Plain, according to the legend Padua was founded by the Trojan hero Antenor; the historical Padua was founded over 3000 years ago, during the Paleo-veneti age, along the Brenta river. In 45 b.C. it became a Roman municipium, due to thriving commerce and abundance of waterways. Destroyed by the Longobards in 601, during the XI century religious and civil buildings were built, such as the Cathedral, the Commune palaces, towers and defensive walls. During the XIII century the Ragione Palace, the Basilica of Sant'Antonio and the University were built. 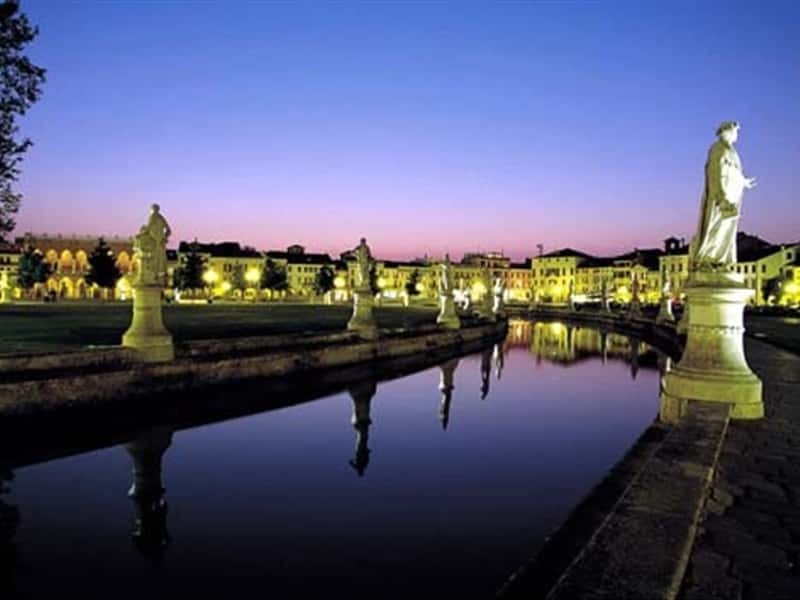 The XIV century historically characterized by the ruling of the Seigneury of the Da Carrara family, is considered Padua Golden Age; one century later the city was conquered by the Republic of Venice. The historic centre of Padua is dominated by the imposing Palazzo della Ragione, built in 1218 to host the court of justice; the upper floor, also called "Il Salone" (the great hall) is one of the largest medieval hanging halls of the world. Piazza dei Signori is a gentle Renaissance square closed westwards by the white façade of the Capitanio Palace and the beautiful Clock Tower. Closeby is Padua's Cathedral, a 16th century building which keeps one of the delights of the town: a Romanesque baptistery with 14th century frescoes by Giusto de Menabuoi. The Caffè Pedrocchi, one of the most famous historical cafès in Italy, built in 1831 by Antonio Pedrocchi and designed the the Venetian architect Giuseppe Jappelli, worth a visit. The most outstanding monument is the Scrovegni Chapel, which was magnificently decorated by Giotto at the beginning of the 14th century, and is universally considered one of the greatest art masterpieces of all time. The Basilica, dedicated to St. Antony, who lived in Padua for many years and died here, is one of the most famous Christian faith site in the world. Locally simply called "Il Santo", it also includes St. George's Oratory, the Scuola del Santo, with tiziano's frescoes, and the Antonian Museum. This town web page has been visited 125,178 times.